"We've tried to work the draft talking points for HPSCI through the coordination process but have run into major problems. Perhaps as a result of the afternoon teleconference, a number of agencies have been looped in. The White House cleared quickly, but State has major concerns. The Bureau cleared with a few comments but asked that Justice, which would handle any criminal prosecution, be brought in. It is evident that will not happen tonight, and Ben Rhodes has asked that this issue be reviewed tomorrow morning at the Deputies' meeting." BACKGROUND: The emails refer to a separate protest that occurred at the U.S. embassy in Cairo, Egypt. Reuters reported that over 300 persons joined that protest. More: "On Tuesday [September 11, 2012], Egypt's prestigious Al-Azhar mosque and seat of Sunni learning condemned a symbolic "trial" of the Prophet organized by a U.S. group including Terry Jones, a Christian pastor who triggered riots in Afghanistan in 2010 by threatening to burn the Koran. "But it was not immediately clear whether it was the event sponsored by Jones, or another, possibly related, anti-Islam production, that prompted the melee at the U.S. Embassy in Egypt, and possibly the violence in Libya." "No mention of the cable to Cairo, either? Frankly, I'd just as soon not use this, then... NSS's call to be sure..."
WASHINGTON, May 15 (Reuters) - A Republican congressman investigating the U.S. Internal Revenue Service's targeting of conservative groups asked the chief of the IRS on Wednesday to make available five mid-level IRS employees for questioning. Representative Darrell Issa, chairman of the U.S. House of Representatives Oversight and Government Affairs Committee, wrote a letter to acting IRS Commissioner Steven Miller asking him to make the employees available for interviews. 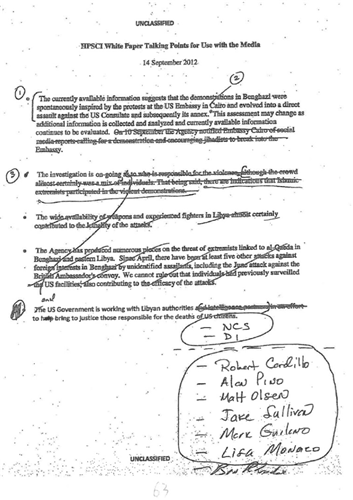 The May 15 letter was obtained by Reuters. Readers, make sure to bookmark this page and follow @ReutersPolitics on Twitter for top news on U.S. politics. Questioners pre-chosen and I'm not one of them. Again. WASHINGTON — President Obama, seeking to regain his footing amid persistent questions over last September’s attack in Benghazi, Libya, plans to call on Congress on Thursday to take action to bolster security at American Embassies, according to a senior administration official. Mr. Obama will make his appeal during a midday news conference with Prime Minister Recep Tayyip Erdogan of Turkey, the official said. He will urge lawmakers to fully fund the State Department’s budget request for diplomatic security. Note to lawmakers: include air conditioning in revised press shield law. Who will be the first to use the rain during this presser as a metaphor for the week?? Quick, you don't have much time! 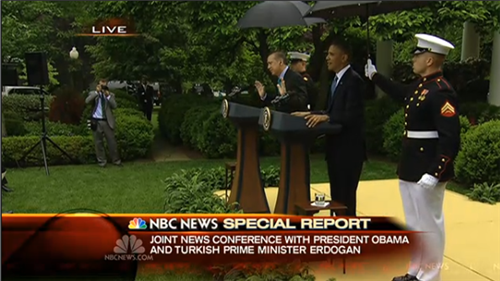 Obama kicks off presser with announcement of new "high-level committee" to advance trade with Turkey. Obama: "We both agree that Assad needs to go." Says Assad needs to transfer power to a transitional body, and that is the only way forward. Obama pivots in remarks: "I am intent on making sure we do everything we can" to prevent another tragedy like Benghazi from happening. Says he has been in discussions with lawmakers, calls on Congress to fully fund its budget requests for U.S. posts around the world, including Marines and guards. Mentions that there will be Turkish help in this effort before passing stage to Erdogan. Some Benghazi offense from Obama: "calling on Congress" for more security funding and implementing recommendations of review board. Erdogan expresses condolences for "terrorist attack" in Boston, says his country has been fighting its own battles with terrorism. Obama on #irs: "We will be putting in new leadership." Pres Obama doesn't want Special Counsel for IRS misconduct; thinks DOJ & congressional investigations are sufficient. 'We know 10s of 1000s of people are being killed' in Syria with or without chemical weapons. Reuters correspondent Jeff Mason asks whether Obama still has confidence in his attorney general and if the AP phone records seizure was an overreach comparable to Nixon. Obama: "I'll let you guys engage in those comparisons." Obama: "I have complete confidence in Eric Holder as attorney general." 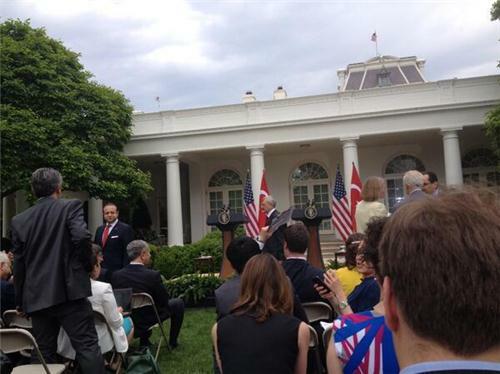 Obama asked about belief that Assad should go -- "how and when?" Responds "the sooner the better," would have preferred he left two years ago. 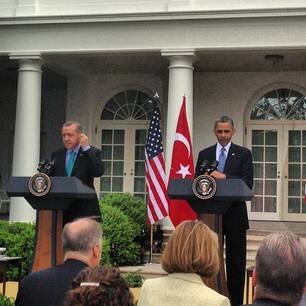 Says U.S. will keep helping the opposition, addressing the humanitarian crisis, and working closely with Turkey. WASHINGTON, May 16 (Reuters) - President Barack Obama said on Thursday he reserves the right to resort to a range of both diplomatic and military options if he receives conclusive proof that the government of Syrian President Bashar al-Assad had used chemical weapons in the country's civil war. Obama, at a joint news conference with Turkish Prime Minister Tayyip Erdogan, said there was evidence of chemical weapons use in Syria but that it is important to get "more specific information" to confirm that before deciding how to respond.